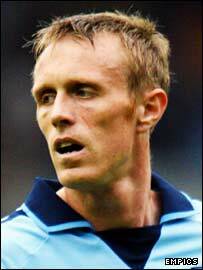 Forest sign Brett Ormerod! | Through the seasons before us..
Yeah, looks like at this point of the season it’s difficult to land a striker who has scored more than one goal. I don’t know the guy very well, but I bet this will give a terrific boost to Grolt’s confidence… I wonder if it was all worth it. Only time will tell. Grant’s been busy making the right wing spot his own, so I’m sure he won’t be too worried! Nevertheless, for the moment I see this only as a move to calm down the grandstand “managers” and not a substantial one. Who knows, I hope both Brett and CC prove me wrong! BTW, does Leon Best always want out of Coventry to come to his beloved native city…? And maybe the loaning of Ormerod signifies that maybe someone wants to “go-go”? Looks like an old Crouch. But not his height!! By the way, he started from a certain Accrigton Stanley and not Blackburn. What is worrying me is that this guy has had a state of injuries through his carrer including one which kept him out for a year. (According to a Wikipedia article)From Southampton he has been sent on loan to Leeds & Wigan (Sky player profile). 2 questions Forest suporters (I’m bring them foward from another article), a) When was the last defeat of the reserves and b) When ws the last time we won when being on Sky? Anybody? Ormerod is a long term target for Forest. We were extremely close to signing him on loan from Southampton when the Ginger one was ‘in charge’. At that time he ended up going to Leeds on loan instead and Megson bemoaned the difficulty he was having in attracting players to Div One. Since leaving Blackpool he has not been prolific in front of goal but is a real grafter up front. He adds to our options and with Tyson to return sooner rather than later as well, we should now have enough up front. Agree with Barrow Red, every time I have seen the lad I have always been impressed with his work rate and ability. His hard work will put some of the other forwards to shame. I wish him the best of luck. Aren’t you guys missing something? He’s been signed by Calderwood as goalkeeping cover FFS. Nice, another player/goalkeper, lol. I thought some players were already getting that!! Yiannaki, as far as I know the last reserves defeat was last season. As for the SKY cameras, I can’t remember the last time we played in front of them and won! Probably it was the away game against Yeovil in last season’s play-offs. Or could it have been v Liverpool, first ever Live Sky game, whoa teddy teddy, teddy teddy teddy teddy sheringham!! Ah, the good ‘ole days! Well, that one day. As for the rest of that season……. Well don’t know what to say, Ormerod seems to be a good player, from what i have seen and remember he has much more technique than 99% of people in this league, from what preston fans are saying he is a very hard-working player, but most importantly say he is a great instinctive finisher, which needless to say we have been severely lacking. Another negative from me i know, but this is the sort of signing that should have been made in january and sums up the blase attitude towards securing promotion for our club from the board. Regardless i hope he has the right effect and good luck to him, we will beat these people tomorrow either way. U-Reds!!!! Oh yes, laugh a min .com!!! Vasillis, I think your right – 2-0 on Sky unless someone can say otherwise. Xerw to (Iknow) the reserves last defeat was last season but when?? Come on Trickies, surley someone knows. If I’m not wrong, they only had 1 defeat last season & walked to the title which led to the other half of that amazing duo being shown the door to Notts County. Oh well… I hope Pemberton takes the job next season regardless if we go up or not…. Quote from Jeff Stelling on Sky Sports just moments ago; “0-0 at Crewe, not good enough from Nottingham Forest”. CC still says we are still there Where? in div.3 next year…Bring on John Pemberton for tuesdays fixture PLEASE !!!!!!!! Thinking more about it,it could be the short term answer.Promote Pemberton to 1st team coach until the end of the season NOW.We can’t be any worse off.He is positive,knows the players and is used to winning.What do you think? Starting on tuesday.Give us some hope!!! Just keep CC and his crazy tactics away from our 1st team squad !!!!!!!!! Currently watching boro cardiff.cardiff are playing as if their lives depended on it.Why can”t someone get the Forest players in the same frame of mind.Every game now is a cup final !! !We have the players ……….